Joseph B. PATE "Sr" was born in 1828 in , Butler, Alabama. He died on 15 Jul 1867 in , Milam, Texas. Joseph married Rebecca FISHER on 20 Aug 1857 in Guadalupe, Texas. Rebecca FISHER was born in 1839 in , , Tennessee. She died on 5 Oct 1899 in Hanover, Milam, Texas. Rebecca married Joseph B. PATE "Sr" on 20 Aug 1857 in Guadalupe, Texas. M i Lawrence Harmon PATE was born in 1858. He died in 1879. Benjamin Clayborn PATE was born on 17 Nov 1859 in Gause, Milam, Texas. He died on 11 May 1927 in Alta Loma, Galveston, Texas. Joseph B. PATE "Jr" was born in Nov 1863 in , Milam, Texas. He died on 8 Jun 1947 in Phoenix, Maricopa, Arizona. M iv William Elijah PATE was born in May 1866. He died in 1947. Robert Arnold KORNEGAY was born on 14 Jan 1837 in Meridaian, Lauderdale, Mississippi. He died on 13 Feb 1912 in Gause, Milam, Texas. He was buried in Pin Oak Cemetery, Milam, Texas. Robert married Ellen M. "Ella" ADAMS on 29 Sep 1879 in , Milam, Texas. 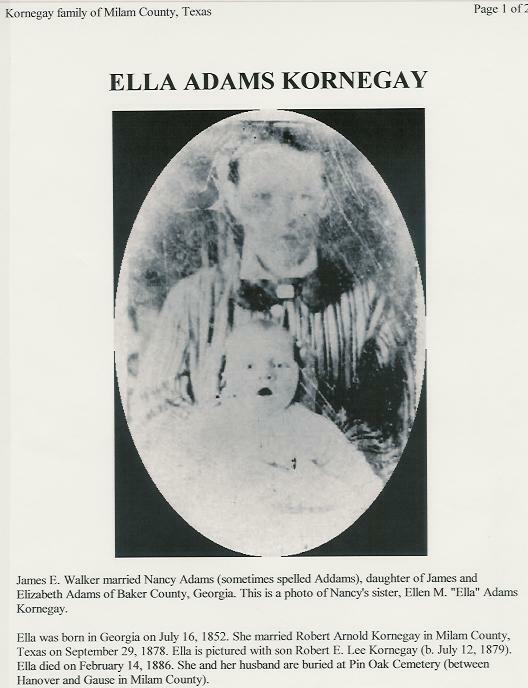 Ellen M. "Ella" ADAMS [Parents] was born on 16 Jul 1852 in , , Georgia. She died on 14 Feb 1886 in , Milam, Texas. She was buried in Feb 1886 in Pin Oak Cemetery, Milam, Texas. Ellen married Robert Arnold KORNEGAY on 29 Sep 1879 in , Milam, Texas. M i Robert E. KORNEGAY was born on 12 Jul 1879. He died on 5 Jun 1925. Joseph E. KORNEGAY was born on 25 Dec 1879. He died on 2 Sep 1889. F iii Elmira KORNEGAY was born in 1883. She died on 12 Dec 1961. Mary Jane KORNEGAY was born on 18 Dec 1884. She died on 2 Feb 1885. M v Lewis William KORNEGAY was born on 27 Nov 1885. He died on 28 Nov 1960. William David "Bill" BAGGETT [Parents] was born on 5 Aug 1877 in , Freestone, Texas. He died on 1 Apr 1965 in Oklahoma City, Oklahoma, Oklahoma. He was buried in Apr 1965 in Gotebo Cemetery, Gotebo, Kiowa, Oklahoma. William married Minnie Leila LUCE on 20 Apr 1897 in , Milam, Texas. Minnie Leila LUCE [Parents] was born on 30 Jan 1880 in Gause, Milam, Texas. She died on 15 Oct 1906 in , Milam, Texas. She was buried in Wealthy Cemetery, Normangee, Leon, Texas. Minnie married William David "Bill" BAGGETT on 20 Apr 1897 in , Milam, Texas. F i Margurette Ethel BAGGETT was born on 20 Jun 1898. She died on 6 May 1973. F ii Effie May BAGGETT was born on 14 May 1902. She died on 27 Sep 1971. M iii William Duke BAGGETT was born on 10 Oct 1905. He died in Jul 1975. William D. SADDLER was born in 1917 in , , Louisiana. He died in Houston, Harris, Texas. William married Eula Faye HAFLEY. Eula Faye HAFLEY [Parents] was born in 1914 in , Milam, Texas. She died on 21 Mar 1981 in Houston, Harris, Texas. Eula married William D. SADDLER. William Allen BAGGETT was born in 1851 in Augusta, Jefferson, Georgia. He died on 29 Jun 1926. William married Mary Elizabeth "Lizzie" FOLK. Mary Elizabeth "Lizzie" FOLK was born on 20 Jan 1857 in Talladega, Talladega, Alabama. She died on 9 Oct 1876. Mary married William Allen BAGGETT. M i William David "Bill" BAGGETT was born on 5 Aug 1877. He died on 1 Apr 1965. Albert Marion RANEY was born about 1875 in , , Arkansas. Albert married Nancy Beatrice "Nannie" PATE. Nancy Beatrice "Nannie" PATE [Parents] was born in Oct 1880 in , , Texas. She died on 13 May 1962 in Houston, Harris, Texas. She was buried on 15 May 1962 in Brookside Cemetery, , Harris, Texas. Nancy married Albert Marion RANEY. F i Mae A. RANEY was born on 3 May 1905. She died on 9 Jul 1998. F ii Alice Pearl RANEY was born on 22 Jan 1908. She died on 26 Mar 1986. F iii Opal Melvina RANEY was born about 1910. F iv Jewel Bell RANEY was born about 1913. She died on 12 Dec 2000. George Washington WOODROOF [Parents] was born on 29 Oct 1887 in , Milam, Texas. He died on 19 May 1952 in Willis, Montgomery, Texas. He was buried in May 1952 in Cude Cemetery, Willis, Montgomery, Texas. George married Mary Deliah RUNNELS. Mary Deliah RUNNELS was born on 11 Nov 1897 in , , Arkansas. She died on 23 Jun 1944 in Willis, Montgomery, Texas. Mary married George Washington WOODROOF. F i Mary Elizabeth WOODROOF was born on 28 Nov 1915. She died on 14 Jul 1955. F ii Prebble Floretta WOODROOF was born on 13 Jun 1921. She died on 2 Sep 1978. F iii Dorothy Mae WOODROOF was born on 28 Apr 1927. She died on 31 Jan 2003. F iv Eva Fay WOODROOF was born on 10 Dec 1931. Clem MC MURTRY. Clem married Jewel Bell RANEY. Jewel Bell RANEY [Parents] was born about 1913 in , , Texas. She died on 12 Dec 2000. She was buried on 16 Dec 2000 in Forest Park Lawndale Cemetery, Houston, Harris, Texas. Jewel married Clem MC MURTRY. DAVENPORT was born about 1913. DAVENPORT married Mary Elizabeth WOODROOF. Mary Elizabeth WOODROOF [Parents] was born on 28 Nov 1915 in , , Texas. She died on 14 Jul 1955 in Conroe, Montgomery, Texas. She was buried in Conroe, Montgomery, Texas. Mary married DAVENPORT. Alfred Madison MASSENGALE [Parents] was born on 20 Oct 1814 in , Coosa, Alabama. He died on 31 Jul 1874 in , Milam, Texas. 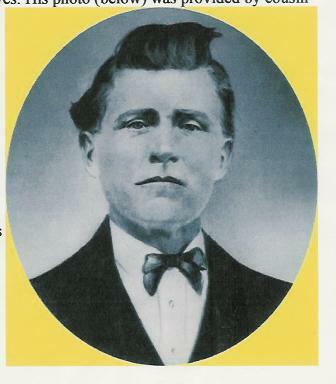 He was buried in Little River Baptist Church Cemetery, Jones Prairie, Milam, Texas. Alfred married Emily R. BULLARD. Emily R. BULLARD [Parents] was born about 1825 in , , Georgia. She died on 23 Dec 1839 in , Coosa, Alabama. Emily married Alfred Madison MASSENGALE. F i Julia Emma MASSENGALE was born on 11 Dec 1839. She died on 10 Feb 1910.